The 36 metre motor sailer yacht Sunny Hill, listed for sale by Bjorn Vang-Mathisen at Ocean Independence in Geneva, has had a further €500,000 price reduction. Designed by Diana Yacht Design, Sunny Hill was built in steel and aluminium by Holland’s De Amstel yard and delivered in 1987 as one of a fleet of three Colombaio charter yachts. She has been expertly renovated and refitted over a period of two years and only took to the water again in the summer of 2010. This very thorough refit meant sand blasting the entire hull and superstructure, not only outside, but also inside wherever accessible, including inside all tanks, and building up the paint again with primers, fillers, adhesive layers and top coatings. Accommodation on this yacht for sale is for 10 guests in five cabins consisting of a full-beam master suite aft and four double cabins amidships, all with en-suite shower facilities. Under power, a single Volvo Penta D12-C engine gives her a range of 4,000 nautical miles. 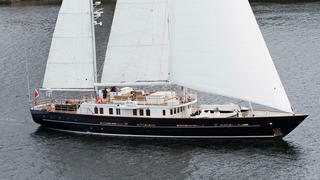 Sunny Hill now sails as, practically speaking, a new vessel, true to her Dutch and Northern European pedigree. The rigorous work, all done in Sweden, using the best subcontractors and manufacturers, has been faithful to the original Dutch design and construction. Lying near Gothenburg, Sweden, Sunny Hill is now asking €2,990,000.